DIE Lunæ, 10 die Decembris. Bill to illegitimate Lady Roos' Children. Brunsell, Proctor in Convocation, Privilege. Ash sent for, for arresting him. Epus. Carlile. Ds. Custos Privati Sigilli. This Day the Lord Privy Seal fat Speaker, in the Absence of the Lord Chancellor. The House agreeing on Friday last to send an Answer to the House of Commons, by a Message, concerning the Votes brought from them by Message, touching the Patent granted by the King to the Canary Company; the Lords now took into Consideration what the Matter of that Message should be. "The House of Peers have considered of your Votes, complaining of the Patent granted to the Canary Company; which being not delivered at a Conference with your Reasons, nor in the usual Manner of Complaints in Parliament, their Lordships have proceeded no further therein." "That the House of Peers have considered of your Votes, complaining of the Patent granted to the Canary Company; which being not delivered at a Conference with your Reasons, nor in the usual Manner of Complaints in Parliament, their Lordships have proceeded no further therein." A Message was brought from the House of Commons, by Mr. Trelawny and others; who brought up a Bill, intituled, "An Act for settling the Estate of John Bodvell Esquire deceased;" which having been passed the House of Commons, their Lordships Concurrence is desired thereunto. Hodie 1a vice lecta est Billa, "An Act for settling the Estate of John Bodvell Esquire, deceased." 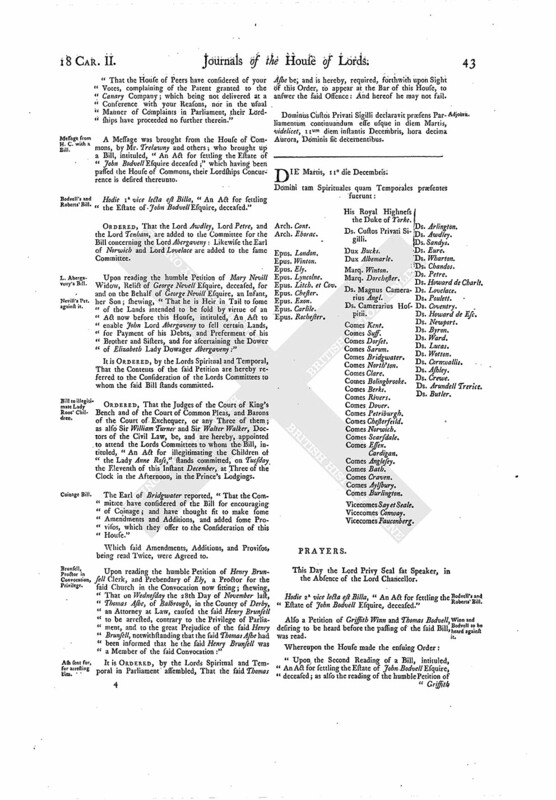 ORDERED, That the Lord Awdley, Lord Petre, and the Lord Tenham, are added to the Committee for the Bill concerning the Lord Abergaveny: Likewise the Earl of Norwich and Lord Lovelace are added to the same Committee. Upon reading the humble Petition of Mary Nevill Widow, Relict of George Nevell Esquire, deceased, for and on the Behalf of George Nevill Esquire, an Infant, her Son; shewing, "That he is Heir in Tail to some of the Lands intended to be sold by virtue of an Act now before this House, intituled, An Act to enable John Lord Abergaveny to sell certain Lands, for Payment of his Debts, and Preferment of his Brother and Sisters, and for ascertaining the Dower of Elizabeth Lady Dowager Abergaveny:"
It is ORDERED, by the Lords Spiritual and Temporal, That the Contents of the said Petition are hereby referred to the Consideration of the Lords Committees to whom the said Bill stands committed. 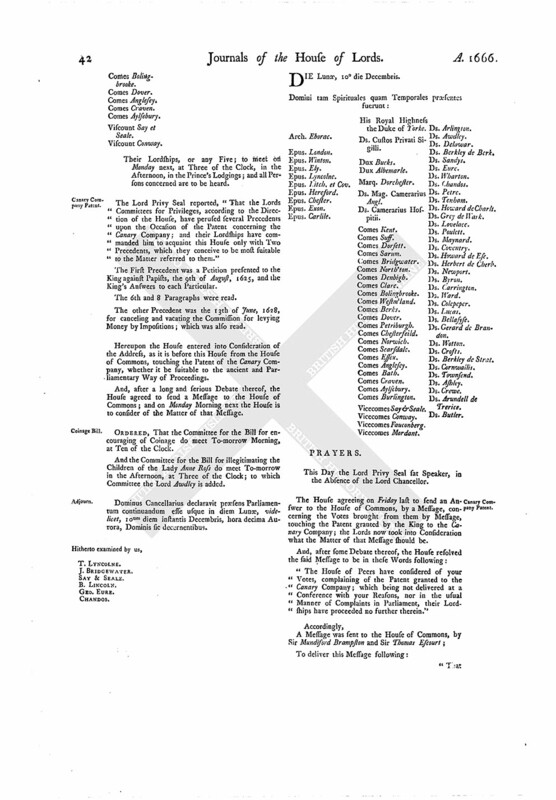 ORDERED, That the Judges of the Court of King's Bench and of the Court of Common Pleas, and Barons of the Court of Exchequer, or any Three of them; as also Sir William Turner and Sir Walter Walker, Doctors of the Civil Law, be, and are hereby, appointed to attend the Lords Committees to whom the Bill, intituled, "An Act for illegitimating the Children of "the Lady Anne Ross," stands committed, on Tuesday the Eleventh of this Instant December, at Three of the Clock in the Afternoon, in the Prince's Lodgings. The Earl of Bridgwater reported, "That the Committee have considered of the Bill for encouraging of Coinage; and have thought fit to make some Amendments and Additions, and added some Provisos, which they offer to the Consideration of this House." Which said Amendments, Additions, and Provisos, being read Twice, were Agreed to. Upon reading the humble Petition of Henry Brunsell Clerk, and Prebendary of Ely, a Proctor for the said Church in the Convocation now sitting; shewing, That on Wednesday the 28th Day of November last, Thomas Ashe, of Balbrough, in the County of Derby, an Attorney at Law, caused the said Henry Brunsell to be arrested, contrary to the Privilege of Parliament, and to the great Prejudice of the said Henry Brunsell, notwithstanding that the said Thomas Ashe had been informed that he the said Henry Brunsell was a Member of the said Convocation:"
It is ORDERED, by the Lords Spiritual and Temporal in Parliament assembled, That the said Thomas Ashe be, and is hereby, required, forthwith upon Sight of this Order, to appear at the Bar of this House, to answer the said Offence: And hereof he may not fail. Dominus Custos Privati Sigilli declaravit præsens Parliamentum continuandum esse usque in diem Martis, videlicet, 11um diem instantis Decembris, hora decima Aurora, Dominis sic decernentibus.